Would you know if it is okay to feed cantaloupe to a hyperthyroid cat being managed with the low iodine y/d diet? The owner feels that their cat is tired of the food and would like to give him a treat. 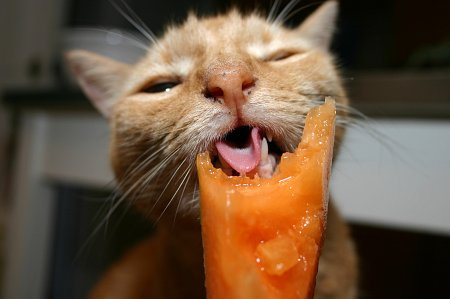 The cat absolutely LOVES cantaloupe. I called Hill's but they didn't know if cantaloupe would interfere with the effectiveness of the diet. The iodine content of food depends on the iodine content of the soil in which it is grown (1,2). Cantaloupe is often grown in iodine-rich soil (as all other crops and fruit), which unfortunately would compromise the effectiveness of the y/d diet. This case represents a common problem that we have with the y/d diet (3,4), which works to lower serum T4 concentrations by severely restricting the cat's iodine intake, thereby reducing the amount of thyroid hormone the thyroid tumor can secrete (5-7). First of all, it's not the most tasty cat food on the market. Secondly, if y/d is going to continue to control the cat's hyperthyroid state, we can't feed the hyperthyroid cat any other cat food or treats that contain iodine or the y/d diet will fail and the hyperthyroidism will relapse. So the bottom line is this: if the cat doesn't like the taste of the y/d, dietary management is not likely to be effective. Remember, if you switch this cat over to medical treatment with methimazole or, even better yet, use radioiodine or surgery to "cure" the hyperthyroid state, you can feed that cat whatever he wants to eat. And isn't that the way cats deserve to be fed, anyway? Yun AJ, Doux DJ. Iodine in the ecosytem: an overview. In: Preedy VR, Burrow GN, and Watson RR (eds). Comprehensive Handbook of Iodine. Nutritional, Biochemical, Pathological, and Therapeutic Aspects. Academic Press, Elsevier, London 2009; 119-124. Hetzel BS, Wellby ML. Iodine. In: Handbook of Nutritionally Essential Mineral Elements, O'Dell BL, Sunde RA (Eds) Marcel Dekker, Inc. 1997;557-582. Hill's Pet Nutrition website. Prescription Diet y/d Thyroid Feline Health (Dry). Hill's Pet Nutrition website. Prescription Diet y/d Thyroid Feline Health (Canned). Melendez LM, Yamka RM, Forrester SD et al. Titration of dietary iodine for reducing serum thyroxine concentrations in newly diagnosed hyperthyroid cats [abstract]. Journal of Veterinary Internal Medicine 2011;25:683. Melendez LM, Yamka RM, Burris PA.Titration of dietary iodine for maintaining serum thyroxine concentrations in hyperthyroid cats [abstract]. Journal of Veterinary Internal Medicine 2011;25:683. Yu S, Wedekind KJ, Burris PA, et al. Controlled level of dietary iodine normalizes serum total thyroxine in cats with naturally occurring hyperthyroidism [abstract]. Journal of Veterinary Internal Medicine 2011;25:683-684.